Novomatic takes a trip to the wild wilderness in Wild Country. It’s a simple 5 reel, 1,024 ways to win video slot that comes with a feature round where you can win up to 40 free games complete with 2x and 3x wild multipliers. Play on your PC, tablet or mobile from between 40p and £100 per spin. The set up here is a little unusual for a Novomatic video slot in that Wild Country is played using a win all ways game engine rather than standard paylines. Winning combinations are created by landing matching symbols on adjacent reels. If the game engine is a little different the visuals are pure Novomatic. You’ll see A to 9 royal values spinning around the reels alongside fish and moose which pay up to 2.5 times your bet per single combination. Next come the big cat and eagle which will get you 0.75, 1.25 or 3.75 times your bet. The best of the bunch is the brown bear which awards 0.25, 1, 2.5 or 3.75 times your bet. Keep a special eye out for the green paw print jewel which can hit on reels 2, 3 and 4 only. This is the wild and replaces everything apart from the bonus scatter. The bonus scatter is the mountain scene. If you hit 3, 4 or 5 of these anywhere on the same spin you’ll get a payout equal to 2, 5 or 10 times your total bet as well as triggering the Free Games feature with 8, 15 or 20 free spins. The paw print wilds can really come into their own during the free spins round as they come with multipliers attached which can double or treble payouts when they make up part of a winning combination. Land 2 scatters and 5 more free spins are added to your total. Hit 3, 4 or 5 of them and you’ll get a full re-trigger of 8, 15 or 20 free spins. You won’t find anything revolutionary on offer in Wild Country. The design is reassuringly familiar and you’ll have seen this range of extras in other Novomatic video slots. The win all ways pays, free spins and wild multipliers offer more than enough action to keep things interesting though. 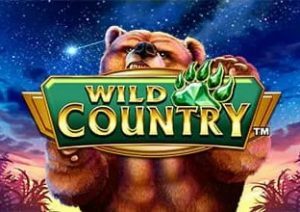 As far as volatility goes, Wild Country sits in the medium range with maximum wins of 2,500 times your bet on every free spin. If you enjoy the simple blend commonly on offer in Novomatic titles, then you won’t be disappointed by what’s on offer here. For a straightforward virtual trip to the great outdoors, you’ll do just fine giving Wild Country a spin. If you’re feeling adventurous, try Playtech’s Roaring Wilds.